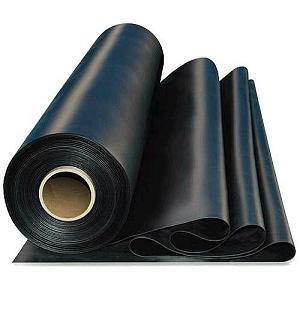 BLACK EPDM Rubber Roofing Membrane, 45 mil, 10x50 ft.
Order accessories in a separate order from rolls for lowest cost shipping. DESCRIPTION: WeatherBond / Versico BLACK EPDM .045” thick single ply roofing membrane. Convenient 50 foot roll weighs about 174 lbs, so it can be easily roof loaded by two people. EPDM is a very elastomeric homogenous roof covering which may be used for new single-ply roof construction and re-roofing applications. INSTALLATION OVERVIEW: Black EPDM single ply membrane is used in Fully-Adhered Roofing Systems. The substrate and membrane are coated with WeatherBond Bonding Adhesive. The membrane is then rolled into place and brushed down. EPDM Seam Tape and EPDM Primer are applied to the seam areas. Ribbed Roofing Termination Bar, 1/8 inch Lip / Sealant Ledge 0.26 x 0.38 inch slots 6-inches on center, ribs on the underside. Aluminum 0.075 thick X 1-inch wide x 10 Feet long. Price/Piece. BLACK EPDM Seam Tape / Doublestick. Double-sided Black Butyl Rubber Based Seam Tape. For Creating Lap Seams in EPDM. LionGUARD Brand High-Performance Seam Tape. Made in USA. 35 Mil Thick 3-inch Wide X 25 Foot Roll. Price/Roll. Black EPDM Seam Tape / Splice Tape. Double-sided Black Butyl Rubber Based Seam Tape. For Creating Lap Seams in EPDM. LionGUARD Brand High-Performance Seam Tape. Made in USA. 35 mil Thick 3-inch Wide X 100 Foot Roll. Price/Roll. Wet Lay EPDM Bonding Adhesive, ChemLink SinglePly, 5-Gal.